Munley Law is currently reviewing cases involving women who have been diagnosed with ovarian cancer after prolonged use of products containing talcum powder. Johnson & Johnson is currently facing numerous lawsuits alleging that the company knew about the cancer risk associated with their talc-based Baby Powder and Shower to Shower products but failed to warn consumers. Our personal injury lawyers have decades of experience handling high-profile product liability cases against major companies. If you or someone you know developed ovarian cancer that may have been caused by talc-based products, don’t hesitate to contact our firm for a free consultation. Email us or call (855) 866-5529. Talc is a mineral found in personal care products, often in the form of powder, such as in Johnson & Johnson’s popular Baby Powder and Shower to Shower products. There is increasing evidence that talcum powder increases the risk of ovarian cancer in women who use the product for feminine hygiene. In a recently settled landmark case, investigators discovered company documents showing that Johnson & Johnson were made aware of the risks of talcum powder as early as 1982, and elected not to change the formula, inform the medical community, or even to warn consumers. It is estimated that as many as 10,000 women in the United States are diagnosed with ovarian cancer resulting from talcum powder each year. While there is still some debate about the safety of non-asbestos talc, the American Cancer Society lists talcum powder as a risk factor for ovarian cancer. 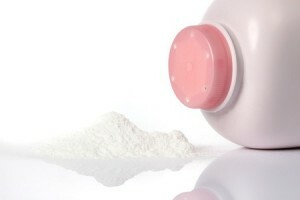 Cornstarch-based baby powder products are deemed safer alternatives to talc-based ones. Johnson & Johnson currently faces legal action from nearly 10,000 plaintiffs who have suffered from the use of the product. Johnson & Johnson was ordered Thursday, July 12, 2018 to pay $4.69 billion to 22 women and their families following a jury’s determination that asbestos in the company’s talcum powder caused the women to develop ovarian cancer. This constitutes the highest verdict to date– Johnson & Johnson has vowed to appeal the award, but if the verdict stands, the award amounts to over $213 million per person. In August, 2017, a Los Angeles jury awarded a $417 million verdict in favor of a woman who claimed that Johnson and Johnson’s baby powder caused her to develop ovarian cancer. The California woman used the product for feminine hygiene for decades. The verdict includes $340 million in punitive damages; Johnson and Johnson intends to appeal. In February 2016, a Missouri jury awarded $72 million to the family of a woman died of ovarian cancer, which she believed to have been caused by decades of using Johnson’s Baby Powder for feminine hygiene. Doctors discovered talc residue in the cancerous tissue, and investigators found that the company was aware of the risks but failed to issue a product warning. The settlement included $10 million for the family’s loss, and an additional $62 million in punitive damages. The first talcum powder cancer lawsuit against Johnson & Johnson was won in a federal court in 2013, on behalf of a South Dakota woman who developed cancer after using Johnson’s baby powder for more than 20 years. Like so many other women, she was unaware of the risk associated with such a common household product. Have You Developed Ovarian Cancer After Using Talc Powder? At Munley Law, we operate on a contingency fee basis. This means that we only collect a fee (a portion of the settlement or verdict) if we win your case. You will never have to pay anything up front or out of your own pocket. Based in Pennsylvania, our firm has helped clients from all over the U.S. Since 1959, Munley Law has spent more than five decades earning a national reputation as some of the best personal injury lawyers in the country. We have been named among the nation’s Best Law Firms (U.S. News and World Report), Best Lawyers in America (Best Lawyers), and Pennsylvania Super Lawyers (Pennsylvania Magazine). Our dedicated attorneys have been listed among the Top 100 Trial Lawyers in the state (National Trial Lawyers) and are proud members of the Million Dollar Advocates Forum. For more information about our legal team, check out our attorney profiles, verdicts and settlements, or real testimonies from our past clients. If you or someone you know have developed ovarian cancer after using baby powder or other talcum powder products, contact our firm to learn more about your legal options. You may be able to file a lawsuit against the company, and be compensated for your medical costs and pain and suffering. Call our office at (855) 866-5529, or fill out our email form. Consultations are absolutely free.